James Bond may travel the globe to complete his missions, but his base will always be the United Kingdom's MI6 counterintelligence agency in London. Here's how to follow in his footsteps and explore the world of 007 on a James Bond tour in London. Travel by bus to London locations such as the National Gallery, Westminster, and Whitehall—made famous in Bond films including "The World is Not Enough," "Skyfall," and "Die Another Day." 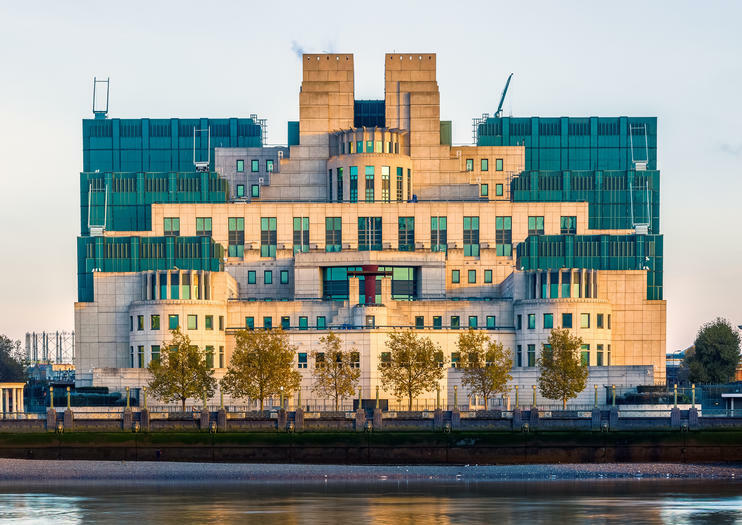 Follow a guide on a James Bond walking tour and discover government buildings such as the SIS Building, located on the bank of the Thames River near Vauxhall and featured in the films as MI6 headquarters. Traverse the streets of London by taxi and listen as your driver sheds light on film location sites such as the Grand Hotel Europe, Le Circle Casino, and more. Escape the city by mini coach and visit far-flung filming locations featured as Zukovsky's casino and Goldfinger's golf club in the "Goldfinger" and "Spectre" James Bond films. Stop for photos outside Pinewood Studios, where author Ian Fleming's famous novels were brought to life on the silver screen. Spend the afternoon spy-gazing with a 2.5-hour walking tour of London’s James Bond filming locations. In the company of your Bond-expert guide, learn about the legendary 007 agent and slip through the streets of the capital to visit cinematic landmarks such as Westminster, the National Gallery, Whitehall and Mi5. See secret hideaways used in classic Bond films including Skyfall and Die Another Day. Enter the glamorous world of 007 on this action-packed 3-hour James Bond tour of London. Follow in the footsteps of everyone’s favorite international spy as you visit filming locations from Bond classics like 'GoldenEye', 'The World is Not Enough' and 'Die Another Day', as well as recent hits like ‘Spectre’ and ‘Skyfall’. Brush up on your Bond trivia as you learn more about Bond actors Sean Connery, Pierce Brosnan and Daniel Craig, then get a glimpse of the real world of espionage as you pass MI6. Discover the movie magic that kept 007 in action happened during this private walking tour of James Bond filming locations. Meet your guide and go at your own pace visiting filming locations from Skyfall, Goldeneye, and other films. See how real-life spy work is done with a visit to parts of Whitehall and learn about the most infamous murder in Cold War spy history. Recreate your favorite scenes from classic London movies on this 2-hour movie hot spots walking tour. Get the insider scoop on filming locations and on-set gossip as you follow in the footsteps of iconic characters like James Bond, Alfie, Batman, Harry Potter and Bridget Jones. Follow the James Bond super-fan trail on this half-day guided tour of all things 007 in a private taxi. See everything from Ian Fleming house to Bond filming locations and get the insider scoop along the way. Visit the bar where the words, “Shaken. Not Stirred” were first spoken and finish your trip with a tour of the 007’s cars in the Bond Motion Exhibition. London has a rich movie-making history and this tour will take you in the footsteps of film favorites including Harry Potter, Sherlock Holmes, Bridget Jones, and James Bond. Enjoy the undivided attention of a private guide as you visit memorable film locations all around the city, admire stunning views along the River Thames, and sample some delicious local foods and drinks along the way. Follow in the footsteps of James Bond, Jack Ryan, Wonder Woman, and other onscreen action stars on this 2.5-hour, film-locations walking tour of London. With a film-buff guide, you’ll visit filming locations from Blockbuster movies such as Wonder Woman, Edge of Tomorrow, Batman Begins, Mission Impossible 6 and Fantastic Four. Pass famous London sights, including the British Museum, Somerset House, Trafalgar Square, and Big Ben, as you hear insider gossip and behind-the-scenes trivia along the way. Enjoy a day our of London on this small group tour by mini coach of iconic James Bond filming locations. Departing from central London and heading to the Chilterns, this tour features informative commentary from your expert guide as you stop and explore 10 key locations from the James Bond films from Goldfinger to SPECTRE. You'll get to walk around Zukovsky's casino, enjoy a visit to the Shrublands health club, see where the action happened at The Bladen Safe House and a take a photo-stop outside Pinewood Studios. There are television shows & there are Cult TV shows. Many of the best ones are set in London. There are countless locations to choose from but we think we have narrowed it down to some of the very best. Some classic, some contemporary but all Cult TV.